A folio case simple in design but impressive in its functionality, the Booq Folio Case is available in 4 attractive colors: red, white, black, and dark blue. Its features include a prop-up position for viewing media and a loop inside for holding the stylus. 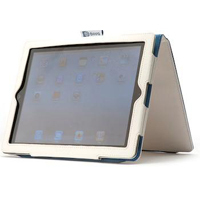 Its magnets automatically power the iPad up or down when it opens and closes. While it doesn’t include a position for typing, you can flip the case around, prop the iPad against something, and use the cover to hold a keyboard in place. It’s nice having a slim, lightweight folio case with full access to the iPad’s features and high-quality materials. The case costs $39.95.